STORRS - He’s one of the last remaining links on the roster to UConn’s postseason past, so perhaps Hergy Mayala is the most qualified to speak on the Huskies’ prospects this season. 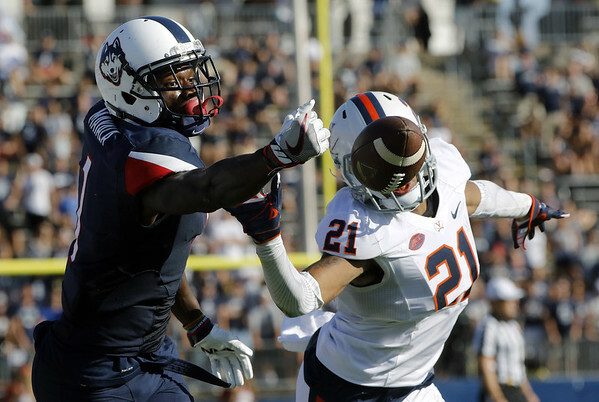 Mayala, the UConn senior wide receiver, made it clear he believes now is the time for the Huskies to go back to a bowl. On the heels of consecutive 3-9 seasons, that’s a rather bold statement. Head coach Randy Edsall hasn’t been so brash despite saying multiple times he expects the Huskies to be much improved this season. A 6-foot-2 senior who grew up in Montreal, Mayala is one of three current Huskies who played the last time the Huskies were in a bowl game. UConn lost the 2015 St. Petersburg Bowl to Marshall - the only postseason appearance for the program in the six years between Edsall’s head coaching stints in Storrs - 16-10. Mayala’s confidence is likely welcome for a program that has been sorely lacking it lately. Though it’s perhaps odd coming from a player who had such a disastrous finish to his 2017 campaign. In the Huskies’ season finale against Cincinnati, Mayala caught a touchdown pass from quarterback David Pindell with no time left on the clock that pulled UConn within a point, seemingly setting the stage for overtime or perhaps a two-point conversion and a momentum-boosting victory to cap the season. But an unsportsmanlike conduct penalty was called on Mayala after the play as he barked a bit at his Bearcat defenders, and UConn kicker Michael Tarbutt then missed what turned into a 36-yard extra point. Mayala talked extensively about the play during UConn’s spring practices, and says he rarely thinks about the infraction. “Not really. It’s behind me. I talked with the coaches, talked with the players and we just decided that moving on we have to be more responsible, more mature,” Mayala said. Pindell, Mayala’s roommate, has for the most part allowed his friend to forget the incident. As a junior, Mayala lead UConn in receptions (43), yards (615) and touchdowns (seven) despite missing two games with an injury. He’s expecting more for his last go-round in college football. “I feel like there’s a lot more I left on the field,” Mayala said, adding that he wants to “take his game to another level” this season. The Huskies open the 2018 season Aug. 30 against Central Florida. Edsall expects to see an improved Mayala on that day and going forward. “I think Hergy has gotten a lot better in a couple areas. I think he understands how hard you have to work and how accountable you have to be to everything,” Edsall said. The coaching staff has been pressing Mayala to become more of a leader to the younger Huskies, something Mayala has tried to embrace. Edsall has decided for a second straight season not to name team captains, but has installed a leadership council in its place. Mayala is in that 13-member group, and is starting to show signs that the coaching staff made a good choice in selecting him. UConn hasn’t had to worry about who would start at middle linebacker on its defense in quite some time. Junior Joseph occupied that spot for most of the last three-and-a-half years, finishing his Husky career with 306 tackles. But it’s not clear who will be taking over Joseph in the middle this season. Sophomore Ryan Gilmartin and senior Santana Sterling are vying for the spot, with Kevon Jones, a true freshman from East Hartford, is also pushing for some playing time. “How quickly can KK (Jones) keep developing? And how does it shake out between Ryan and Santana?” Edsall said, trying to explain the position battle. Edsall said the position battle will likely be determined in the coming days. Posted in Newington Town Crier, UConn on Thursday, 9 August 2018 19:43. Updated: Thursday, 9 August 2018 19:46.